Do you want to cook healthy and delicious food in less time and without the hassle? With TupperChef Inspire, you can! TupperChef Inspire is a cookware innovation from Tupperware, the world’s leading brand in food preparation and kitchen storage solutions. The collection—which includes the Casserole, Stock Pot, Frypan, and Wok—are all designed to provide stress-free cooking and guilt-free eating experience. Click CONTINUE READING to know more about its features. The cookware features a smart lid with a dual-use vapor-vent valve, which makes cooking with less water and oil possible. It also allows effortless browning of meat in its natural fat. With this technology, you can preserve more flavors and nutrients in your food, making them healthier and more savory. Waterless cooking is also faster than traditional meal preparations, which means less waiting time to eat and less electricity to use. You not only have the option to prepare healthy dishes conveniently and quickly, you can also save money on water, electricity and gas bills! 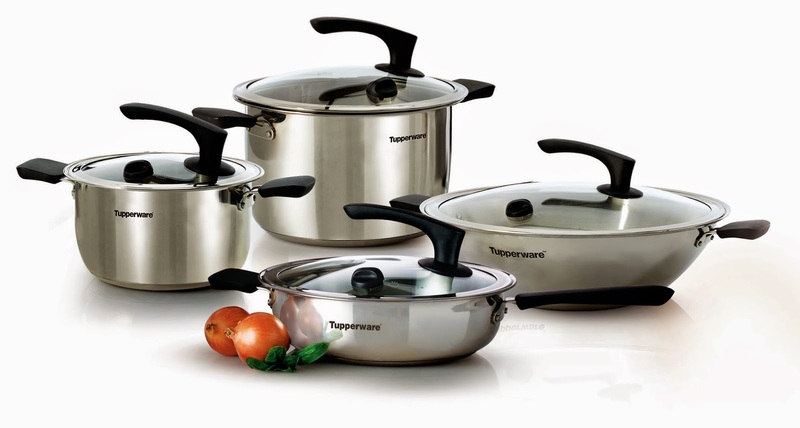 Elegant and functional, all products in the TupperChef Inspire collection are made with special grade stainless steel, which resists corrosion and does not leak onto food unlike aluminum pots and pans. You can be sure of the quality of food that comes from Inspire Cookware is toxic free. Tupperware Philippines is celebrating its 48th anniversary this year with new innovations and exciting anniversary specials! Grab a copy of the latest Tupperware Brands brochure for their latest offering and product updates. I love tupperware.yes so elegant and functional.unlike others the quality of this is super nice..